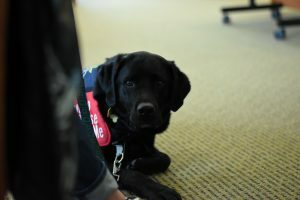 Therapy dogs are dogs who go with their owners to volunteer in settings such as schools, hospitals, and nursing homes. While Service Dogs are trained to help their handler mitigate a disability and ignore strangers, a therapy dog has the exact opposite job. 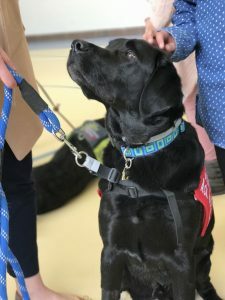 Therapy Dog Teams that are certified through The Exceptional Sidekick are amazing ambassadors to the work that we are doing at schools, events, and public outings. When The Exceptional Sidekick is asked to make an appearance, we like to educate the public on the difference between Service Dogs and Therapy Dogs and there is no better way than to bring both types of dogs with us. 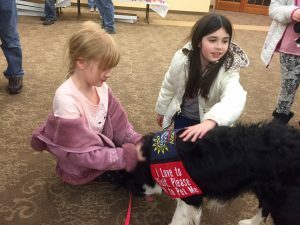 Our Therapy Dog Teams are required to volunteer 10 hours a year promoting The Exceptional Sidekick at school events and fundraisers, some of which include the Newtown Labor Day Parade, Sandy Hook Career Day, Bridgewater Fair, and community outreach programs. In their spare time they are free to visit nursing homes, hospitals, libraries, or anywhere else that they please. We have many Therapy Dogs that accompany their handlers to work at places like Blue Sky Behavioral Health. Therapy Dogs are not Service Dogs and therefore do not have the right to enter public spaces without first getting approval from the facility. It is unethical to attempt to pass off a Therapy Dog as a Service Dog for purposes such as flying on a plane or being admitted to a restaurant.